There are many reasons to upgrade your stock diesel truck. Some people require more power for hauling or towing, and others may need higher speed capabilities for racing. Others are hobbyists who simply enjoy the satisfying roar and dependability of a diesel engine. Safety is an important reason to upgrade or modify a truck that is often overlooked. Our truck steering parts ensure that your truck is running safely, so you can rely on it day after day for many years to come. At CPP Diesel, we have the Cummins suspension parts that you need. Although it is impossible to prevent accidents entirely, there are steps that can be taken to reduce the chances of one occurring. Using quality truck steering parts is absolutely essential if you want to be able to make fast, evasive maneuvers that can prevent an accident. Additionally, relying on worn steering parts can be extremely dangerous. Unfortunately, plenty of accidents occur due to equipment failure, and many of them could have been prevented if the driver had properly maintained their vehicle. One of the main reasons so many people love their diesel trucks is that they just feel good. Boosting speed, horsepower, and torque provides a ride that other vehicles just can’t compete with. Naturally, using the right Cummins suspension parts plays a huge role in that. Your stock steering parts may be adequate if you keep the rest of your truck stock, but if you are the kind of person who is constantly modifying and upgrading your diesel truck, it is important that your steering and suspension can keep up with the added power. You may not be planning on selling your truck now, but you never know what the future holds. Every aftermarket upgrade can be listed, and each one adds value to your vehicle. There are plenty of people out there that seek out modified diesel trucks, as it saves them time that would be spent buying and installing new parts. Adding a Cummins steering box or other Cummins suspension parts is a great selling point if that day should ever come. You can shop with confidence at CPP Diesel, knowing that we carry only the best Cummins suspension parts on the market. We are proud to call ourselves member of the diesel community, and our commitment to quality parts and low prices proves that. We also offer exceptional customer service, free shipping on orders over $50, and a generous refund or return policy. 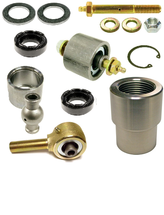 If you would like a quote or further information on any of our parts, feel free to give us a call at (724) 785-4022. Get the best deal on steering and suspension parts and accessories from CPP Diesel today.